Captain Eoin Morgan’s return to form is a positive sign for England as they aim to win their first World Cup, says former captain Michael Vaughan. England’s 18-run victory over Sri Lanka on Saturday sealed a 3-0 one-day series win with a game to spare. 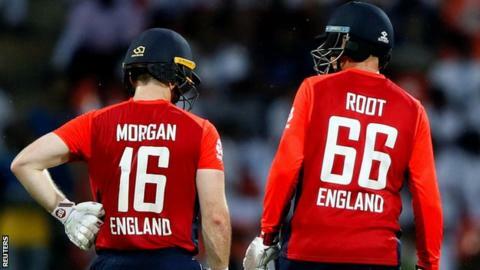 Batsman Morgan, 32, said this month he would drop himself at the 2019 World Cup if it benefited the team, but he is averaging 195 in this series. “Morgan looks in as good a form as I’ve seen him for many years,” Vaughan said. Morgan made an unbeaten 31 before rain ended play early in the fourth one-day international in Pallekele on Saturday, giving England victory on the Duckworth-Lewis-Stern method. The World Cup, which takes place from 30 May to 14 July, will be held in England and Wales. England have lost in the final three times – in 1979, 1987 and 1992 – but are currently top of the International Cricket Council rankings. Speaking on the Test Match Special podcast, Vaughan said: “To win a World Cup you need quality players but also a captain that is sure of his place in the side. “Morgan is a very clear talker and communicates well to his players. He’s very relaxed but very driven. England were knocked out of the 2015 World Cup in the group stage, three months after Morgan took over the captaincy from Alastair Cook. However, since then they have won 51 of 76 one-day internationals, losing 20, with one tie and four no-results. “England could have got rid of Morgan after the last World Cup but they stuck with him,” said Vaughan, who played 82 Tests and 86 ODIs between 1999 and 2007. Alex Hales replaced Jonny Bairstow at the top of the order on Saturday after Bairstow twisted an ankle while playing football in training. Hales, who was previously a regular in the side, scored 12 in his first ODI since June. Liam Plunkett missed the first three one-day internationals because of his wedding, which allowed Warwickshire pace bowler Olly Stone making his debut. “England are 90% sure of their starting XI for the World Cup,” Vaughan said.